Mi Account Unlock Tool is a small application for Windows Computer which allows you to quickly remove the Xiaomi MI Account from your Xiaomi Smartphone. 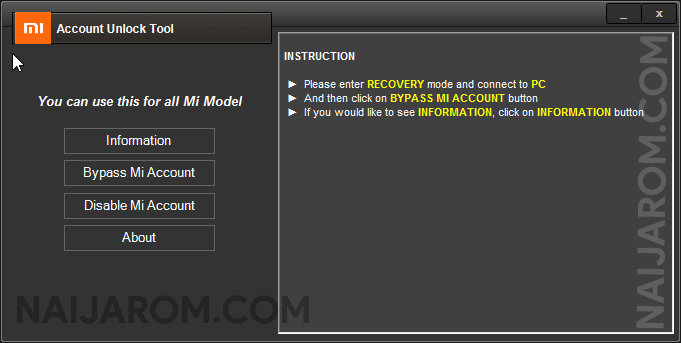 Firstly you need to boot your Xiaomi Smartphone or tablet into the recovery mode, then connect the device to the computer using the USB cable, Then after click on the Bypass Mi Account button. It also allows you to get the information about the connected Xiaomi Smartphone or Tablet on the Computer. It also allows you to easily disable the Xiaomi Account on your Xiaomi Device. [*] Take a Backup: If you are going to try the above tool, then please take a backup of your Android Smartphone or Tablet as resetting the account may brick the device. [*] Credits: Mi Account Unlock Tool is created and distributed by Mobile Software Advance. So, full credits goes to Mobile Software Advance for sharing the tool for free.